Jim Yates was born in Montreal, Canada. He came to England at the age of twelve, and after completing his schooling at Prescot Grammar School, he started teacher training at Carnegie College in Leeds. During the 2nd World War he served in the RAF, and when the war was over he returned to Carnegie College to complete his teacher training. There he met Freda, with whom he was happily married until Freda passed away six years ago. 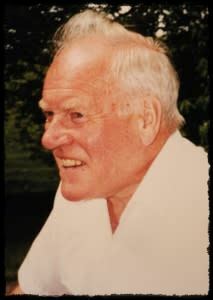 Jim taught at Baines Grammar School for several years, and then moved to Arnold Boys School, where he taught and later became Deputy Head of the Junior School until he retired in 1980. In his retirement Jim enjoyed visiting, together with Freda, his daughter Penny and family in Munich, Germany. He also enjoyed composing songs with his son Michael and his close friend Peter Jebson. Jim was a keen sportsman all his life. He played basketball for Blackpool for many years with close friend Jimmy Armfield, and he was an active member of Marton Tennis Club. He continued to play tennis well into his eighties. He was also a loyal and active member of Anchorsholme Masonic Lodge for most of his adult life. Jim will be sadly missed by family and friends, but for those who knew him, happy memories will prevail.